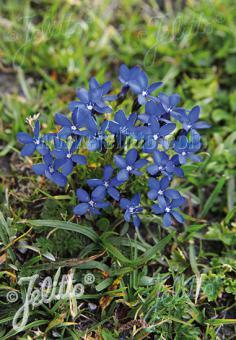 Origin: Southeast Europe, Slovenia: moutain meadows. Special Features: Large flowering, very vigorous form. GENTIANA verna ssp. Tergestina has a slightly lighter blue than the species. The flowering period is four weeks later than the species. The botanical name refers to an origin from the region near Trieste (Italy) on the Adriatic Sea.